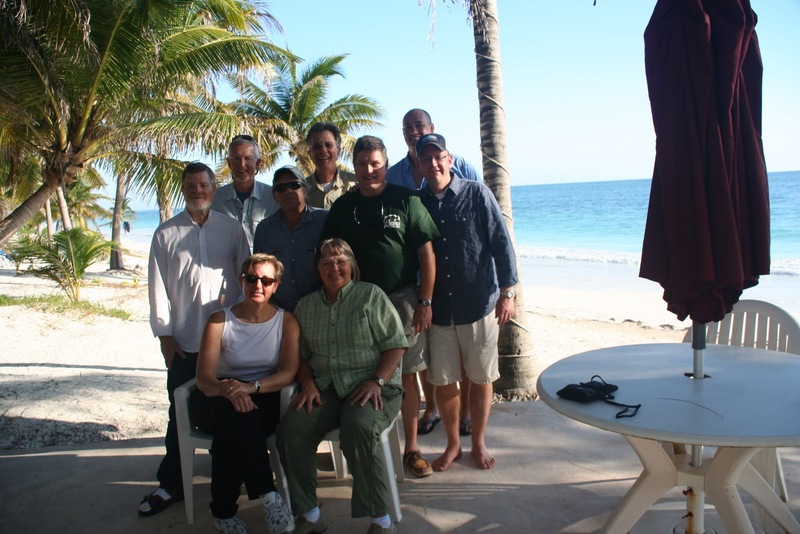 We just returned from another successful trip to Boca Paila. Jon Uhlenhop hosted a group of 9 anglers to the Yucatan for 6 days of guided fishing. The group was split between first-time saltwater anglers and seasoned Boca Paila veterans. The weather was great and the fishing even better. Day One: I fished with first time saltwater fly angler Jim Prybylo. We headed south towards Ascension Bay, about a 45 minute ride from the lodge. On the first flat, we were greeted by large bonefish feeding as singles or pairs. After a few attempts, Jim caught his first bone on fly – a nice fish pushing the 4# mark. After a few more bones, we spotted a tailing Permit, then another, and another. With the Permit jitters running high, let’s just say our casts were far from perfect. We ended the day back at the Boca watching other anglers hook fish after fish out of the Bonefish kiddie pool. 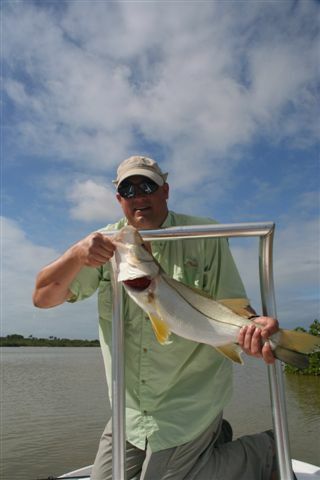 We poled the deeper mangrove edges in search of Snook and had a few shots, an eat, but none to the boat. Back at the dock I looked at my boat partner and commented that, little did he know, but that was about as well-rounded an introduction to saltwater fly fishing as one can get: Bonefish, Tailing Permit, and Snook all in 8 hours of fishing. Welcome to Boca Paila! Day Two: I fished with Ben Kweton on his first saltwater outing. Again, with permit fever running high we headed south in search of clear water looking for Permit. We started with a bonefish or two, three Snook (Ben’s first), then turned our attention to the deeper flats. With variable light conditions, spotting fish in deeper water was difficult and we spooked the fish with the boat before we could get our casts off. Then, with Ben manning the guns, our eagle-eyed guide spotted a big ray with a Permit swimming on top. “CAST”… Ben pulled one out of the caboose and back-handed a perfect 40 footer in the direction of the ray/permit duo. One strip and the Permit ate. He elated some words of disbelief (using profanity I recall) as his line went sailing out through the guides. One problem: Ben wears a size 15 shoe and that is a lot of foot to keep off the fly line. My verbal attempts and meager efforts to clear the line failed and we now had a 15-plus pound permit half-hitched to Ben’s leg. After a brief recap, and Ben putting himself in the penalty box, I had a few follows from fish with no takes. I think the count on Permit sightings that day was 15 or 16 sightings and about 5 good shots. We ended the day contemplating cutting off Bens feet at the ankles to avoid any future podiatric malfunctions. 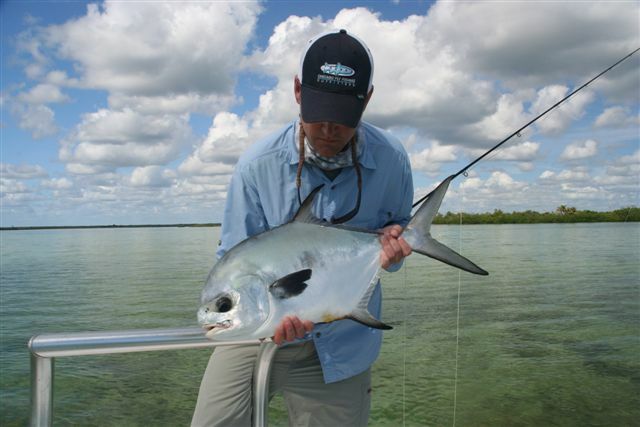 Again, a memorable day… to hook a permit on the first cast EVER to a Permit (Ben still has no idea how lucky he was). Day Three: I fished with good friend and traveling companion Ron Sirota. Again, we were drawn south by the last few days experience. Now, Ron has spend about the equivalent of about 6 weeks in search of the elusive Permit. I really wanted to see him get one to the boat. 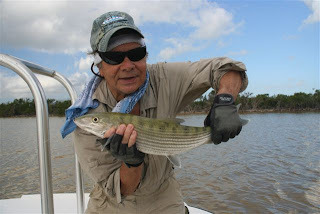 As an accomplished caster, Ron had no problem landing a bonefish right off the bat. We then headed to the deeper water and were again plagued by mostly cloudy skies making seeing fish difficult. Then it happened: Ron had a great 50’ cast to a pair of cruising fish and they both turned on his fly. I am not sure what happened but I thought for sure that he was buying drinks that night back at the lodge. The fish swam off and Ron remained Permit-less. We had a few more good casts and follows and marveled at the amount of opportunities we had. Day Four: I had the pleasure of spending the day with third-time trip veteran Mary Gilmore. Eager to make up for her lost Permit from her first trip to BP we headed down to the Permit grounds and crystal clear water of Ascension Bay. This was my most action-packed morning as we each caught bonefish, saw big Cuda, Sharks, and a school of small permit. Our guide Eduardo then poled us into deeper water and then like clock-work, we began to see the wakes of cruising Permit. I was up first and cast short on a group of three. Then Mary had a few good shots at the next groups, including one cast that landed almost perfect – but the Permit veered off course a few feet shy of her cast. She was generous enough to give me another shot on the bow and then it happened. I recalled in my head how I had seen many Permit spook when I made the first strip a bit too aggressive (making the crab pattern “jump” quickly rather than stripping it slooooowly. I made the cast on the leading fish and made the first strip slow. My like came tight, I cleared the line, made some remark of dis-belief, and watched my line come off the reel. When the fish stopped after the initial run, I turned and gave Mary a high-five. 23 minutes later, a nice 12# Mexican Permit rolled on its side and came to hand (thanks to Sage and their new SAGE ONE 890-4). 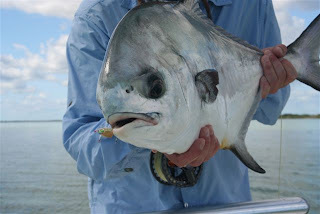 After a few glamour shots, the fish was released and we looked for more Permit. Toward the end of this memorable day, Mary insisted on giving me the bow as I blind cast fruitlessly in the channels looking for a tarpon to complete my grand-slam. It never happened but it was a memorable day and a treat to spend it with an angling friend. Day Five: Terry Polonus and I paired up and headed to Ascension Bay to attempt another day of Diverse opportunities. The bonefish were skittish due to the constantly shifting wind (Bonefish feed into the wind). We had some early shots and landed a few. With Terry on the bow, we headed into a sheltered bay and found a laid-up Tarpon on a flat near the mangrove shoreline. Terry made a cast and the fish began to follow. The Tarpon flared up on the fly about 30’ from the boat and ate. Unfortunately, the hook never found a soft spot and the fish swam off. We then turned our attention back to Bonefish and saw a number but hooked few. After lunch we poled a deeper flat looking for Permit (Terry had yet to see one). Half way through out drift I spotted a small Permit on the move. 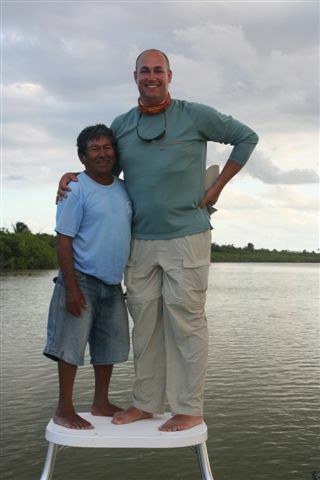 Terry launched a quick cast but the fish was already on its way to Belize. We finished the day searching for Snook and Terry got one cast at a single fish cruising the mangrove edge. It was not interested in eating and also headed for Belize. On our way back to the dock I mentioned to Terry that he had a “visual grand slam” today! Day Six: I was stuck fishing with Ben again so we asked our guide if we could go hunt for Permit. After a brief Mexican standoff, we headed north to the bonefish flats of Laguna Campechen. Our guide Victor had the best eyes of anyone I had fished with before, spotting bonefish far off. Skinny water and bright skies called for long casts and we connected on a number of Bonefish (only after I had a few strip-setting mishaps). Then, our guide yelled, “Big Fish man” and we circled to see a huge Snook cruising off our port in open water. A few misguided casts later and the big fish spooked and swam off. I asked Victor how big the fish was to which he replied, at least 25#. With Ben once again safely in the penalty box, we went in search of more Snook around the “bushes”. We stumbled upon the “Kiddy Pool” and boated 15 juvenile Snook through the afternoon. Modelo, Red bull, laughter, Snook, and good companionship made the last day of the trip a delight.